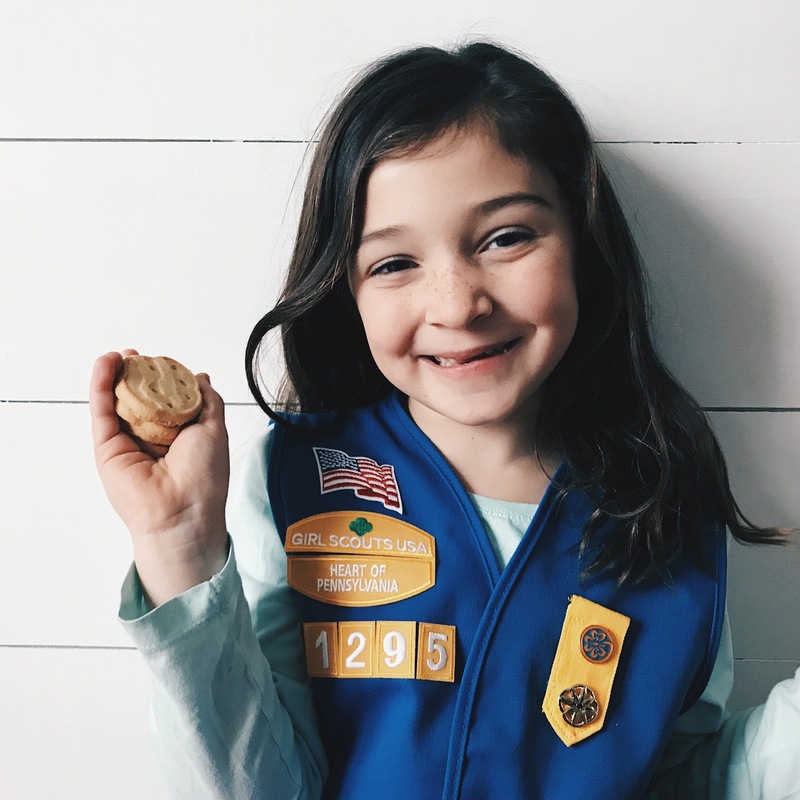 I was a Girl Scout growing up until I felt it became too uncool for me to be one anymore. A ridiculous excuse but there you have it. See also middle school is hard. Anyways. I wanted Letty to be a Daisy something fierce and expected to get info sent home once she started kindergarten but no, they don't do that. I didn't find out about our local troop until half way through last year so I just let it go. But this school year I signed her little self right up. And it makes it so much more fun because a whole bunch of her girlfriends are in her troop and I like all their mommys so we just get to sit around gabbing during each meeting. Winner winner! Fast forward a few months later and I'm very pleasantly surprised by how much she loves it! The patches! The crafts! She even has the Girl Scout Promise nailed down pat! But the biggest surprise at all has been this whole cookie thing! I imagined her maybe asking her aunts and uncles.... Her Nonna and Pop. And that would be it. Well. Color me shocked. She asks me multiple times a day if she got any new orders on her Digital Cookie site. Did anyone message you mom with a cookie order!? She painstakingly writes down the person's name and their order and then works her way through the math as she tallies their total. The joy she gets any time someone orders even a single box is sort of amazing to see. And then! She wanted to go door-to-door selling cookies! We can't really do that in our development because you can't throw a stone and not hit a Girl Scout... So she asked to go around my parent's development and she pranced right up to the doors in her uniform and sold some cookies. Well, basically she barely managed an audible "would you like to buy Girl Scout cookies?" and a "thank you!" but she did sell some! Which is hard, I remember! I am just so very shocked. And pleased as punch that she has found yet one more thing that she likes to do. Gotta get this girl her Thing. Whatever that may be. And also thank you thank you to anyone who has ordered cookies and made her entire face brighten up. It's kind of the best. Letty is the most adorable little Daisy I ever did see! Mercy, she’s a doll! How fun that a bunch of her friends are in the scouts as well. That always makes it more enjoyable. she is the cutest daisy ever!